Persuasive content has been the most effective mechanism for convincing humans to take action ever since the serpent talked Adam and Eve into eating the forbidden fruit. Words have not lost this power. From print marketing to digital media, persuasive content is what drives leads and sales into your clients’ businesses. This is where a solid content marketing strategy comes into play. 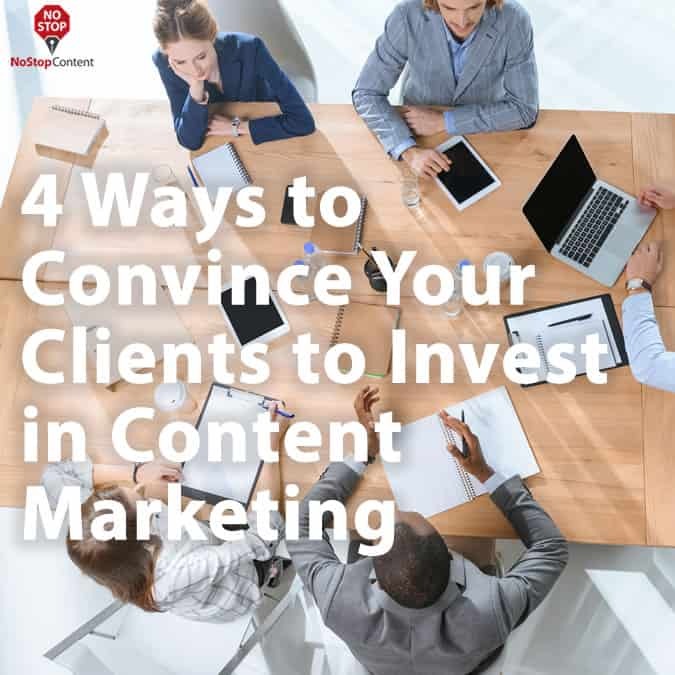 However, convincing clients to invest in content marketing is not always an easy pitch. Many clients can’t see the long-term benefit of several pieces of content driving leads and sales into their pipeline. Often, they can only see what has an immediate impact on the bottom line, leaving only pennies for their marketing department or agency to work with in terms of budget. Businesses want concrete reasons for investing in content marketing. Practical, fact-based arguments are more convincing to them than theories. An ideal place to begin is by bringing attention to how regularly publishing content addresses every marketer’s most pressing issues. If you build it, they will not come unless you make them. Many clients will spend a gazillion dollars on the prettiest whiz-bang website without a single thought as to how they’re actually going to get people to it. While pay-per-click and other forms of digital advertising can be expensive, they do provide the most immediate benefit in terms of traffic generation. Clients must be willing to lose some money in the beginning as they test different ads and landing pages to see what works. SEO is another option that can be more cost-effective in the long-term. However, it does take longer to see the benefits. But an effective content marketing strategy that uses the best-performing PPC keywords as focal points for blog posts will create a win-win situation for you and your clients. You’ll look awesome because you’re helping them profit, and they’ll reap the benefits of a content marketing campaign that works smarter not harder. Words are what convert website visitors into leads and leads into customers. There’s no way around it. The prettiest website in the world with all the latest bells, whistles, chatbots, video spokespersons, and popups is of no effect at all if its words do not convince people to buy more stuff. Done rightly, content marketing can be the ultimate conversion driver for your clients. For example, a focused blog that targets the best-performing PPC keywords can also serve as the hub for Search Engine Optimization and Social Media Engagement. When your client can use and repurpose content to blast out on-theme messages to their market, leads and sales are bound to flow in with great conversion rates to boot. This is more than blogging. Content marketing is an intentional strategy that solves the marketing dilemma articulated above. Here are some of the primary advantages of regular content creation. Content brings attention to issues about which your clients’ target market needs to be informed. It also makes prospective customers aware of your clients’ business as a viable solution provider for these issues. Because blog posts provide useful information rather than making hard sells, the content has a higher perceived value among readers. This perception prompts them to discover who’s creating the content and what they have to offer. People who visit blogs are in search of specific information rather than something to buy. But if this information is presented in an engaging fashion, solution-seeking readers can easily be converted into warm leads. Content marketing lets your clients benefit from keyword-targeted blogs posts that can rank well in the search engines and address specific concerns of the target audience. Once a visitor becomes a warm lead, the next step is to nurture them until they become paying customers. Content can be used in blog posts, email newsletters, social media posts, podcasts, and videos to accomplish this goal. Daily blogs posts should be the foundation. Then, the posts can be repurposed for use through other online media channels. Engaging content will cultivate devoted followers and brand ambassadors who actively promote your brand through word-of-mouth. This is the best kind of publicity: free. People tend to trust other people’s opinions more than advertisements. Your content needs to be informative and helpful in order to garner this kind of influence. But when this power is harnessed properly, your clients’ blog can become a powerful lead-generating, customer-getting magnet. Every business website needs a blog. Fresh, relevant content not only brings in traffic, but it helps pre-sell readers on products and services after they’ve already accepted a brand as an authority on the subject in each post. Clicking through to an opt-in page, quote request form, or contact form or picking up the phone to call is the next logical step when blog content is leveraged in this manner. Plus, blogs that are regularly updated only increase in value over time. Each post becomes a silent salesman who sets up its booth in the search engines, beckoning visitors to stop by and learn how a business can help them solve the problem related to their query. Before long, a business’s blog can become an authority in their industry, which leads to several backlinks that only increase inbound traffic and search engine rankings. What’s the Next Step for Your Agency? 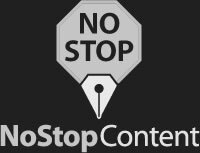 If your agency needs help with content marketing for your clients, then partner with NoStop to provide engaging custom content that’s both informative and conversion-focused. Content is ghostwritten by our proven team of copywriters and 100% owned by you. Plus, our rates are economical, which means there’s no price gouging, ever. We also provide discounts to qualified agencies looking to scale. Discover why SEO agencies worldwide trust NoStop to craft custom copywriting for their clients. Contact us today!